Unfortunately all fish including betta fish, only live so long. You have made a connection with your fish, watched them grow and flourish within their tanks and fed them daily. The memories you have made with your betta you will keep for a lifetime, although it is important to send your betta off with a special burial. In this article we have outlined some thoughtful ways to make a special burial for your betta fish opposed to the old fashioned, morbid, flush them down the toilet. Often, children grow attached to their betta fish even if it is to only have a lifespan of a few months. To many children, a fish is just as important to them as another animal such as a dog or a cat. 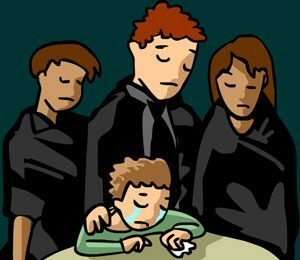 By holding a small funeral for your Betta it allows children to properly understand and grieve. If you intend on having a funeral prior to or after the burial of your Betta, it is nice to include a short speech, poem or song that reflects the life of your fish. Think about your speech, poem or song as this may be how the fish will be remembered. Some owners also like to pay their respects to their Betta fish by lighting a candle or taking a few moments of silence in memory of their loved pet. Some owners also like to create a scrapbook of the life of their fish to share with others or to reflect upon later. In the scrapbook some include: dried out leaves from plants within the Betta’s previous tank, drawings, photographs of the Betta and brochures of the pet stall he/she was originally purchased from. If you feel as though you want to create an everlasting memento of your betta fish there are multiple ways in which you can do this. Some of our ideas include using their previous tank to grow an aquatic plant (if your Betta did not previously have any other tank mates), placing an aquarium statue in their previous tank and personalizing it with their initials or painted detail (ensure the paint is non toxic if you have other fish still living in the tank) or you can use your Betta’s bowl to hold flowers in memory of them. There are many ways you can lay your Betta fish to rest. We encouraged you to make sure your Betta is truly deceased though before burial. Furthermore we strongly disagree with flushing your deceased fish down the toilet as they may have died due to an illness that they will then pass onto other fish in that water stream. Watch their gills for any slight movements as lying on their side can be a common sign of a constipated fish. Some people like to keep their deceased animals close to home. The soil within your backyard is a perfect place to lay your fish to rest as their body will naturally decompose over time. Make sure if you choose to bury your fish in your backyard that you at least bury them half a meter or more below ground level to deter any other animals from digging them up. 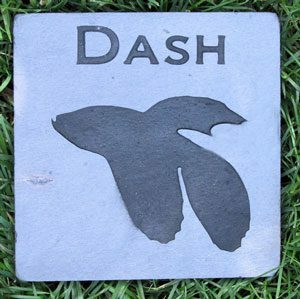 You can place a rock or home made tombstone above their grave to mark it or alternatively many people these days opt to plant a tree or large shrub above the grave in memory of their pet. The pot plant burial is based off the same idea as the backyard burial although allows you to move your pets grave if you move house as well as protects the grave from being dug up by other animals you may have in your yard. Using a medium to large pot plant, fill it half way with soil and then gently lay your fish in the soil. Some people like to wrap their fish in cloth. 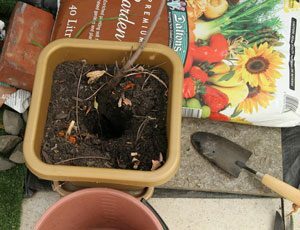 Then place approximately an inch of soil above the fish and then plant your chosen flora. A flowering plant works well because when it flowers you will be reminded of the good memories you shared with your beloved pet. Paw pods have been designed as a dignified way of burying your pet. They are biodegradable and are used to encapsulate your fish in a tomb like container until natural means take place. 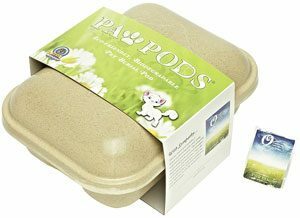 Paw pods come with their own sympathy cards and seeds used to place a plant above the burial site. You may have heard of pet cemeteries for dogs but many pet cemeteries accept a range of animals including fish. 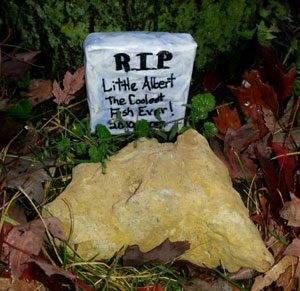 Pet cemeteries are a great way to honor your fish and ensure you can still visit them no matter where you move to. A pet cemetery will often include a small funeral service in the cost of the burial. 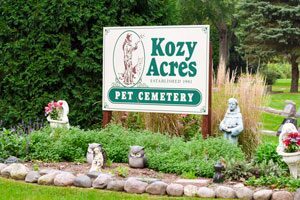 Most pet cemeteries also offer cremation. This is something we do not recommend at home due to the grieving aspect of your betta’s death. If you intend on using the tank to home another betta fish ensure you clean it out thoroughly. Quarantine any tank mates that were in with your deceased fish as they may be carrying a disease.